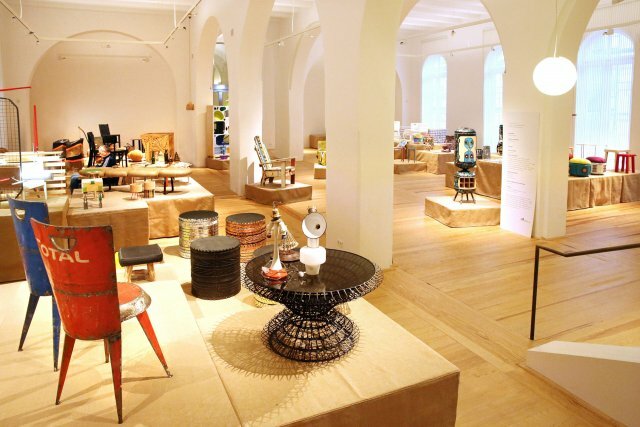 Institute for Foreign Cultural Relations in Stuttgart, Germany, to hold 'PURE GOLD - Upcycled! Upgraded!' exhibition from April 21 to 26. Bulky trash, waste, cheap materials: pure gold! At least in the eyes of many active designers. The “PURE GOLD - Upcycled! Upgraded!” exhibition explores the subject of rubbish and presents approaches to using trash to create valuable products. The exhibition is being organized by the Institute for Foreign Cultural Relations (ifa) in Stuttgart, Germany in cooperation with the Goethe Institut Hanoi and will take place from April 21 to 26 at Heritage Space Gallery in Hanoi. Entry is free. Global industrialization and ever greater levels of consumption make upcycling an urgent matter, and ifa is therefore addressing this issue in a design exhibition, a platform, workshops, and conferences. The cornerstones of the project are ethics, responsibility, internationalization, and co-creation. The PURE GOLD exhibition consists of two complementary parts: the physical and material exhibition and the virtual platform as a space for dialogue, discussion and the storage of knowledge. The materials used in the presented examples are nearly all easily available anywhere and more or less “free”, and yet are often seen as trash with little value. The same is true for the techniques used to rework them and the artisanal know-how that in many cases is based on traditional methods. The aim of the exhibition is to remove the bad reputation reuse has and encourage a new notion of raw materials and thus also a new appreciation of these products. Working with seven curators from Europe, Latin America, North Africa, the Near East, East Asia, Sub-Saharan Africa, South Asia, and Southeast Asia, ifa has brought together 76 exhibits and a total of 53 designers at the exhibition, of which a special selection will be shown at Heritage Space, where they present added value and appreciation within many diverse contexts. The exhibition is accompanied by a local workshop, which took place at the beginning of April at Heritage Space. Ten local upcycling artists were invited to share their upcycling creations and contribute these to the exhibition. In addition to the exhibits, there were making-of videos of the objects from the workshop in Hanoi and former workshops. As a further level for discussion and knowledge, these so-called indestructible video clips will be on view at the exhibition as well as on the Pure Gold platform (http://pure-gold.org).